Did you happen to see that cornfield over yonder? If you look really closely, you'll find that there's a new scarecrow on the scene, doing the duty of keeping those crows away. And she's not particularly scary either, really, she's quite a poor excuse for a "scare" crow. She's actually sweet, but she's a little salty, too. Come to think of it, she's downright sassy! We are talking, of course, about the Sassy Scarecrow, and rumor has it when night falls, she's pretty inclined to head into the village for a party. We actually think you should consider giving her role a try! Think about it. A sassy scarecrow that knows how to have a good time? Sounds like a ton of fun to us! This costume ensemble comes with the signature dress, along with a hat, collar, pettiskirt, and wrist cuffs. The fun dress has a delightful blend of patchwork, faux suede, and straw accents. The theme carries through to the hat, and the burlap/straw collar and wrist cuffs complete the style. The boots we have pictured are sold separately, and you can pair any of your favorite footwear selections to complete the head-to-toe look! We're all about scarecrows as a Halloween choice, because, come to think of it? We're love all of the Halloween classics! We've got a massively wide selection, so for everything from frauleins to Frankensteins, we've got you covered. Sassy or sweet, scary or spooky, we've got the choices to let your personality show through in your character selection. We do, after all, have the world's largest selection of costumes! 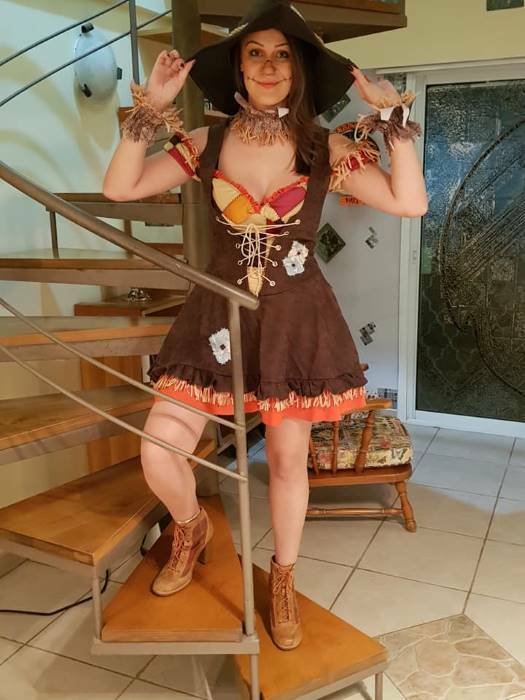 So, give this Sassy Scarecrow Costume a try, and let us know how Halloween goes for you!